And over the weekend, I heard an industry insider propose $1,000-a-pound uranium! "That's crazy talk," I said. "No," the industry insider said. "It would only raise the price of power from a nuclear plant to a level five times as high as it is currently. In a peak oil scenario – where gasoline is trading at $15 per gallon – that's quite doable." He has a point. If the cost of fuel for our cars can quintuple, then so can the cost of electricity for our houses. And the idea of quintupling energy prices is not that far-fetched. As the name suggests, peak oil is the theory that global oil production is near a top. At that point, oil companies can drill more and faster, but they won't be able to keep up production. To make matters worse, demand is likely to keep climbing even if production declines. Heck, the International Energy Agency expects global oil demand to increase 1.7% in 2007, breaching 86 million barrels per day. And we haven't even talked about potential geopolitical problems yet. The mounting confrontation with Iran is just the latest in a long string of problems. Tension in the Middle East just exacerbates the underlying fundamental problems. Unfortunately, I see no end in sight to the tensions. 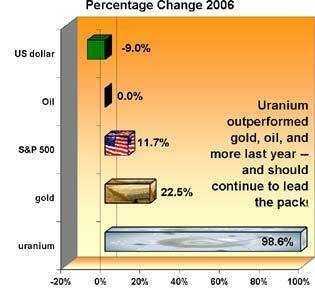 Despite the 99% increase in uranium prices last year, production from mines actually fell 5% from a year earlier. Last year, uranium production was 102.9 million pounds, while demand was 176.3 million pounds. This year, demand should hit 183 million pounds, exceeding production by 56%. Those figures are from industry leader Cameco. Where's the demand coming from? While speculators are getting into the game, the big demand comes from utilities that operate nuclear power plants. There are 435 nuclear reactors operating around the world, and 28 more under construction. By 2013, 48 additional nuclear power plants, producing 43.5 gigawatts of energy, should go into service, according to the World Nuclear Association. Here's the kicker: Each one-gigawatt nuclear power plant needs about 600 metric tonnes of uranium to start up. Then each consumes 200 tonnes every year thereafter. That's a lot of uranium! The farther out we go, the more nuke plants we can expect. 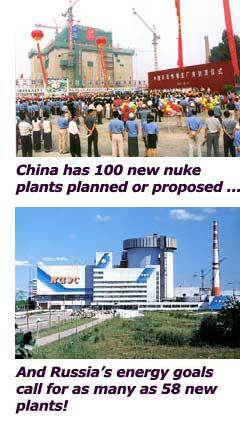 China has 100 nuclear reactors either proposed or planned. Russia's energy goals call for as many as 58. Toward that goal, Russia recently announced it is tripling the amount of money it will spend on nuclear power between 2008 and 2010 to $5.75 billion. It's the same story in many places around the globe. What about the U.S.? This is the part where steam comes out of my ears. There are 28 applications for new plant licenses from now until 2009. There should be double or triple that number, especially if we want to survive that oncoming collision with peak oil! Much of our electricity currently comes from coal plants. And although it's easy to think of electricity as a clean energy, coal plants are the dirty underbelly. Coal accounts for about 40% of global emissions of carbon dioxide, a greenhouse gas that traps heat in the atmosphere. So what to do? We can build nuclear power plants instead of coal-fired plants. An operating nuclear power plant emits zero greenhouse gases. Every 1,000-megawatt reactor saves 3.4 million tonnes of coal a year … eliminates 34,000 tonnes of polluting sulfur dioxide … and stops 11,000 tonnes of nitrogen oxide from getting into our atmosphere. A lot of people fear nuclear power because of radiation. Well, here's the irony – Americans living near coal-fired power plants are exposed to higher radiation doses than those living near nuclear power plants! That's because coal is saturated with impurities, including uranium and thorium, as well as sulfur, mercury, arsenic and other poisonous heavy metals. Over one million people die each year from air pollution caused by coal-fired power plants. That's more than 100 people every hour. Thousands more are born with birth defects thanks to mercury poisoning from coal pollution. Sure, companies are working on "clean coal" technology. But it's still unproven. And one thing we do know is that clean coal raises the cost of the energy produced … pretty much to the point of wiping out any cost advantage that coal currently has over nuclear power. Bottom line: There are many reasons to expect more nuclear plants in the future, and just as many reasons to expect even higher uranium prices. Is $1,000 a pound still crazy talk? Hard to say. After all, we're already pushing up against the $100-a-pound mark sooner than I expected. Uranium Participation Corp. trades at about an 18% premium to its net asset value. I look at that as a vote of confidence that the price of uranium will go at least 18% higher. And as I told you today, a lot of smart people have every reason to believe prices will increase a minimum of 47% in the next 18 months. Uranium Small Cap #1: It has a very small market cap right now, but in the not-too-distant future it could easily be worth a billion. What I find especially attractive is the fact that its prime properties were originally staked in the late 1960s and explored in the late 1970s. After the Three Mile Island disaster, all that valuable data went into deep storage. So the company has inherited a detailed treasure map to some of the richest uranium deposits in the world. Your cost to buy into those reserves would be just pennies on the dollar. Uranium Small Cap #2: This company's team has about 280 years of uranium expertise — they can handle anything! And right now they're poring over the company's huge database of drilling and survey data compiled in the 1970s and 1980s, by oil companies that were exploring for uranium all over the Western U.S.
Short-term events have created a buying opportunity in these shares. Meanwhile, the company has filed papers to list its stock on the American Stock Exchange. I think that could really get the money flowing in! Uranium Small Cap #3: After the Berlin Wall fell, this company scooped up old Communist-era uranium resources for pennies on the dollar. Now, it's trading for about a tenth of what its resource base is worth. This stock is already on the move, but I see more gains ahead! And these are just a few of the opportunities out there. I can't give you the names … that wouldn't be fair to people who bought my latest uranium report. However, the point is that there are plenty of undiscovered uranium beauties out there. All you have to do is perform a little research. While it won't always be a smooth ride, the profit potential is certainly great. P.S. If you want to learn more about those three companies I just mentioned, along with three additional recommendations, check out my latest special report on uranium. As part of the package, I'll also send you four updates throughout the year. Just call us at 800-400-6916 and say you want "The Small Uranium Wonders" report or order online at my secure website.